Brooks Half Marathon was my first event of the year and I am happy to report no knees or shins were damaged in the completion of this race. I entered the 10km category, naturally. I currently lack the tenacity to run 21km, plus I have the attention span of a spoon for runs that last any longer than 2 hours. Maybe some day. The race took place around Bukit Jalil, a suburb of KL. Anytime you get a route with the word ‘bukit’ in it you know the terrain is going to be anything but flat. I am nostalgic about the area because it is where my old office is and for 3 years I commuted there. Getting to Bukit Jalil was straightforward. We left home at about 4:45am and arrived around 5:10. It took us an additional 15 minutes to secure a parking spot. Given the traffic jam at the entry points that morning, I thought we did pretty well. We had ample time to stretch and take care of nature’s call. I loved the idea of the race startline: inside a stadium! It wasn’t my category’s time to run yet, so I headed to the stadium balcony area and watched the 21km participants get flagged off at 5:30. It was an awesome sight to see the 3,000+ people streaming through the start line from a distance, so vibrant and full of energy (of course this gets grossly reversed when they reach the finish line). There was a small group of kompang players beating on their handheld drums with gusto, pumping more motivation than angry dogs nipping at your ankles. Video: See the 21km and 10km Flag-Off! Then it was time for the 10km runners to get into position, also another 3,000+ of us. I did some warmups with guidance from the emcee and her stretching sidekicks, but only a handful of runner folks were seen imitating. As I’m doing this, I started to fidget with my Garmin watch to get it to pick up my heart rate from my chest belt and footpod to calculate my distance. But then it kept restarting, an indication that the battery is running low. Bummer! Why couldn’t have my watch picked a better time to go MIA on me. I liked knowing how fast I ran each KM, how many calories I burned and what my heart rate range was. So I gave up trying to configure the watch and used the only function it could give me at that point: your run-of-the-mill stop watch. After a loud countdown from the lady emcee over the speakers, we were off! The flag-off was my earliest one so far, at about 6:15am. The stadium track path was softer to run on than any other surface I had ever practiced on. I passed by the boys playing kompang with a feeling of renewed enthusiasm as I made my way outside into the cool outdoor dawn. This is precisely why I sign up for these runs: to feel alive! Since it was still early in the morning, it was dark outside. As we’re making our way to the highway in the first km, I was mindful and alert of where I was running to avoid bumping into somebody or tripping over a stone I couldn’t see since lighting was poor. My Energizer headlights would have been useful at this early leg. I also have at least 3 songs entitled Breathe in various genres. Telepopmusik, Melissa Etheridge and Sixpence None The Richer; all tell me to keep heaving in and out. Along the Bukit Jalil highway, I passed some people with relative ease. Some were already wheezing and walking in this early stage, maybe they are just getting warmed up or are not regular runners. Then a garbage truck passed us by, stopping momentarily the supply of fresh morning oxygen. Nothing makes me run faster than the aroma of trash wafting from a moving lorry. Except the stink of sweaty armpits, of which there was plenty. I passed by the Astro building (my old workplace) but I merely gave it a glance and pressed on. The lane was getting narrower as we’re exiting to go into KESAS highway, so overtaking people had to be done with care to avoid cars hitting you. Since it was still dark it’s easy to anticipate cars from their headlights. We then hit a water counter around km5 at which point I am happy that I had been running non-stop with decent pace. And then I realized, hey this run so far doesn’t have markers telling you what KM you’re at. Maybe it’s for the better, sometimes being clueless helps you to move along. The biggest tackle was that mountain of a highway from KM9-10 that we had driven on earlier that morning. I managed to run it with a few stops to catch my breath. And I picked up my pace as we left that big hill to get back to the stadium where the finish line was. On the way I passed a school where students and teachers were seen gazing at us, either out of admiration or they thought we were nuts to be pushing ourselves so hard. As I entered the stadium I was half-expecting the end to be near the entrance, but of course that would’ve been too easy. We still had to run another 400 meters inside the stadium to get to where we started. The last few hundred meters of any run is always a psychological warfare for me: I see the finish line but suddenly my legs want to relax or cramp up and completing the course seems a bit more torturous. I decided to take it easy and jogged the rest of the way, and then finally in the last 20 meters I floored it. I finished! I completed the nearly 11km route in 1h 27m. I was off my target by 12 minutes, but I hope to do better next time. Out of 1000+ some women in my category, I was ranked #383. Ok lah. 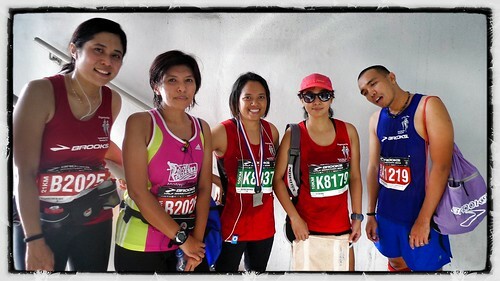 When I was done, I was ushered to join the queue to pick up our finisher’s medal. Half marathon finishers get a medal and a cert, while the 5km fun run people received only the certificate. When we finally made our way out of the stadium, we were given kaya buns to replenish our energy but I didn’t eat mine because bread was the last thing I wanted. I wanted iced Milo to drink but the lines for that is forever long at these kind of events, so I made do with 100 Plus. Then we saw people with watermelons and I was super happy because lately I have developed an undulating adoration for watermelons; they are just the perfect hydration and refueling that I craved. There was even a stall serving tau foo fa (a sweet soya bean dessert) and that was incredible-tasting too. I enjoyed them with relish because they were so effortless to eat (no chewing required, only slurping!). The atmosphere post-race was truly Malaysian, with the whole pasar malam (night market) vibe going on. My take-away from this race was that I truly enjoyed it. The Brooks organizer and the Bukit Jalil Running Club did a wonderful job putting together this nice event and I am thankful I breezed through it injury-free. The timing of the start off was excellent (always great to run pre-sunrise!) and the venue and route chosen were stellar in my books. The only qualm I had was the running vest – it was super thin! So thin that when a lady sweats it’s enough to reveal the brand of her sports bra. 😀 And it didn’t dry quite as fast as other brands I’ve tried, so I’m not sure what the deal is with Brooks’ fabric sweat-wicking technology. In conclusion, I look forward to run this route again next year if they have it. And this time, I’ll make sure I smile for the paparazzi. Loved that the race started in a stadium. Giving amateur athletes a taste of the spotlight! @myindodotcom brooks cudn’t make it ada hal pg tu.. Good luck babe! @stoodlerist is that your magic number of days before run to carbo load? What’s your carbo of choice? @myindodotcom actually i just wing it. just an excuse to eat a lot and claim it under carbo-loading, haha! @myindodotcom although to be serious maybe 2-3 days. pasta’s good i think. @myindodotcom tengkiu! berlari dlm hujan la baru mcm dlm movie. @stoodlerist btw we’ll be running w A in 10k, then maybe teman N to finish up HM. See you there, koling2. @myindodotcom woah so that means everyone’s running an HM? 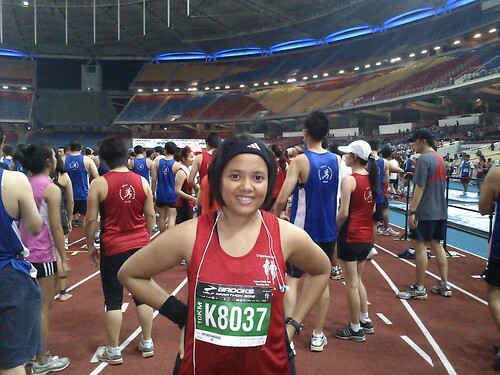 @stoodlerist i meant the last few KM tu kot kitorang pacekan N in her HM. @myindodotcom oooo i see. alright, good luck to everyone and have fun! @myindodotcom Erh? I didn’t know they do timing for running. Last time only motorsports. @MK84 yalah mmg got timing chip what if not how you know your finishing time? @myindodotcom I know running ada timing. Just didn’t know it’s by Mylaps. They were AMB.it previously in motorsports timekeeping. @MK84 you’re talking Greek now. AMB.it? @myindodotcom Ha-ah that’s the company last time. Now dah jadi Mylaps. Nervous abt trow’s Brooks run. Flagoff 6:15am (!). Listening to run playlist to calm down but hard to when all songs are fast tempo! @myindodotcom No sign of rain so far…. @stoodlerist Eh results keluar kat mana beb? Note to self: when running last few km & passing cameramen, try to look as though still alive & energetic. Lift arms at least, damn it.